In the summer of 1837, Peter Christen Asbjørnsen and Jørgen Moe left on their first mission to collect Norwegian folk tales. In 1841, their first pamphlet collection was released: ‘Norwegian folk tales, collected by P. Chr. Asbjørnsen and Jørgen Moe’. Asbjørnsen and Moe were not the only folk tale collectors in Norway, but the quality of their works has been of great importance in the Norwegian folk tale genre. 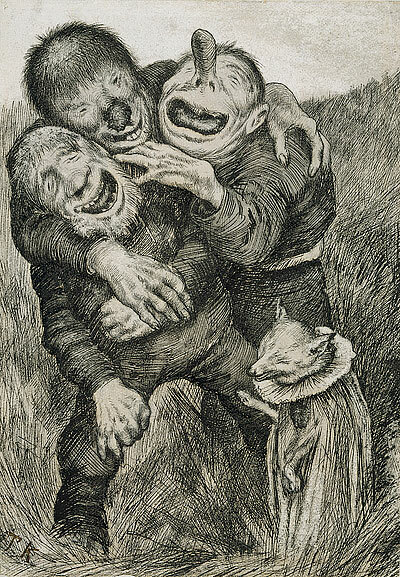 According to traditions, Asbjørnsen and Moe wanted to preserve the oral expression in their collected fairy tales. The tales are far from direct copies of the stories they heard in the country. All the stories have been edited to enlighten certain comic elements, nature descriptions and special Norwegian characteristics. At the time, Norwegian orthography was very similar to Danish. The language was therefore poorly suited for retelling fairy tales. Asbjørnsen and Moe solved the problem by applying the principles of the Grimm Brothers using a simple linguistic style in place of dialects, while maintaining the original form of the stories. At the same time the language in the tales also contained many words from Norwegian dialect, and helped create an autonomous Norwegian written language, distinct from Danish. Fairy tales can be divided into four main categories: Animal stories, real stories, comical stories and reciting stories. The real stories can be divided into sub-categories: Legend tales, fairy tales, short stories, and fairy tales about stupid trolls. The most-known fairy tale character in Norway is the Ash Lad (Norwegian: Askeladden). He represents the small man who succeeds where all others fail. He always wins in the end, often winning ‘the princess and half the kingdom’. Read the story about the Ash Lad Who Ate a Match With the Troll here. 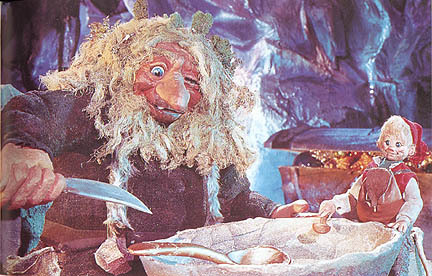 The famous Norwegian filmmaker Ivo Caprino used many of Asbjørnsen and Moe’s fairy tales as basis in his puppet films. See excerpts from Caprino’s puppet film ‘Little Frick and the Fiddle’ here. The Legends (Norwegian: Sagn) tells a shorter and simpler story than the fairy tales. Historical legends are often about people and events from the past. For example, the ‘origin legends’ tells of how the mountains were made or why they look like they do. The mythical legends describe supernatural beings that interfere in human life or about people with supernatural abilities. Examples of Norwegian Legends are The Legend of Olaf the Holy, The Legend of Strong Nils and The Legend of Jostedalsrypa. Jostedalsrypa (The ‘chick’ from Jostedalen) tells the story about a girl who was the only resident of Jostedalen that survived the Black Death in the 14th century. ‘Whence did you get those from?’ asked the Bear. ‘Oh! My Lord Bruin, I’ve been out fishing and caught them,’ said the Fox. Yes; the Bear did as the Fox had said, and held his tail a long, long time down in the hole, till it was fast frozen in. Then he pulled it out with a cross pull, and it snapped short off. That’s why Bruin goes about with a stumpy tail this very day.